How many times have we heard a statement such as that over the course of our careers? Countless times. Statements such as those – and their negative counterparts – contribute to your “employer brand” – the reputation of your association as a place to work. Today, through the Internet, social media and mushrooming employer review sites, all it takes is a Smartphone and a spare moment to make – or break – your reputation as an employer. Your employer brand has far reaching consequences for your association, impacting candidate recruitment, membership retention and ultimately, revenue. Today’s job candidates (and tomorrow’s leaders) are keenly aware of your employer brand. As of 2014, more than 85% of job seekers have a specific company in mind when they begin their search – a “wish list” comprised of organizations they’ve identified from “Best Places to Work” lists, GlassDoor.com reviews and positive word-of-mouth. Likewise, 63% of job candidates consult more than eight resources to investigate whether what employers say about themselves corresponds to what “unbiased” resources report. At Tate / Cummings, we take a proactive approach towards employer brand management. Our employer brand services include identifying objectives,performing employer brand audits and crafting and deploying sustainable employer branding campaigns. We manage and enhance your employer brand so you can reap the rewards of an excellent employer brand reputation. Why let your employer brand be defined by a handful of former employees when you have so many great ambassadors – board, staff, supplier, members – even the general public – whose positive experiences with you could be harnessed to power your association? 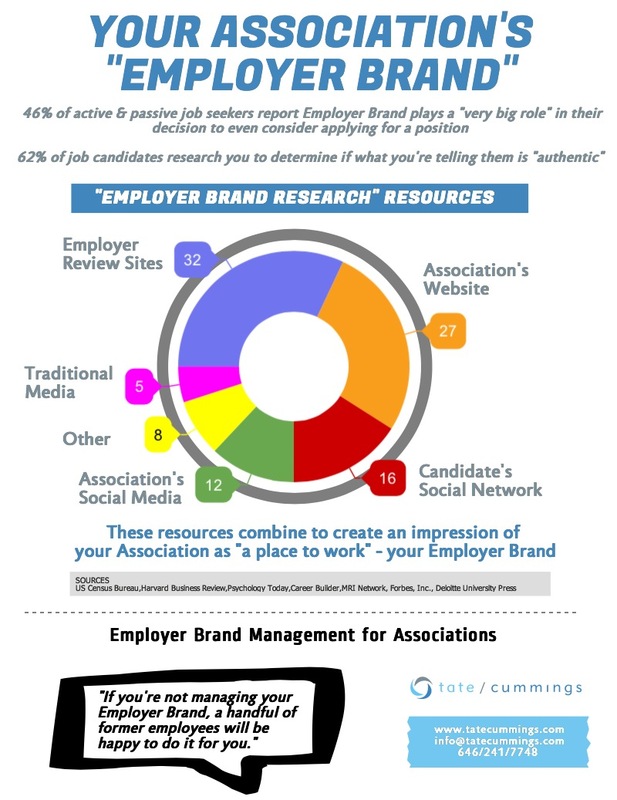 The 2015 Employer Branding Report is now available. Please help yourself to a copy today!